The Go 6100 is TomTom’s top-of-the-range dedicated sat nav. It has a big, vibrant, clear screen, full European mapping with lifetime updates and free, built in traffic and speed camera warnings. Effectively it does everything you’d hope a sat nav would, but it doesn’t come cheap, with prices of around £280. In an era of genuinely impressive smartphone navigation apps the appeal of a proper, fully-featured nav might be limited, but for some drivers a dedicated sat nav is vital – and something like the Go 6100 is likely to be top of the shopping list. The Go 6100 impresses out of the box – the unit is solid and very well constructed, with a hefty, durable feel. The screen is approximately as large as on a big ‘phablet’ smartphone, such as an iPhone 6 Plus. It’s as clear and responsive as a high-end smartphone too, thanks to a capacitive touchscreen and familiar controls, like swiping through screens or pinching to zoom. Inputting a destination is easy, but if you go by postcode it takes a little more effort than a Garmin, since numbers require you to hold down your finger on the corresponding letter. On a Garmin the numbers are displayed separately. It’s a minor quibble and it only makes a difference of a few seconds when inputting an address. The Go 6100 has a built-in SIM card which keeps traffic and speed camera information up to date for free. This also doubles up as a web connection, allowing drivers to search for points of interest in detail. You can, for example, type ‘Butchers’ in the navigation will find all of the local butcher’s shops. For changing destinations on the go there is a voice command function that generally works quite well, but like most voice command systems it isn’t flawless and will sometimes mishear. The unit will always be listening out for the phrase “Hello TomTom”, so you can activate voice commands entirely hands-free. Once you have input a destination the Go 6100 works very well indeed. The screen is uncluttered and clear and directions are very easy to follow. It’s also easy to see potential traffic issues plotted on the map, which the navigation unit will attempt to avoid if it can save some time on the journey. ETAs are typically accurate and in our tests we found the traffic alerts to be a little more prompt than on the similarly priced Garmin Nuvicam. However we still think the best traffic alerts come from the free Waze mobile phone app. That does require you have a suitable phone, though, which isn’t ideal, particularly for drivers who rely on their nav daily. There are some fun features to make the Go 6100 your own, including various colour schemes for the display and an array of voices to give directions. There are British, Irish, Australian and American accents out of the box, but owners can also download silly add-ons including Roger Moore, KITT from Knight Rider, Stephen Fry and Yoda. Voice packs cost around £7 and require you to connect the nav to PC. That depends very much on what you need your nav for. Garmin’s similarly priced Nuvicam has an ace up its sleeve in the form of a built-in dash camera, but we think as a navigation system it isn’t quite as good as the TomTom. So, if you’re in the market for a top-end, dedicated navigation system and you don’t need a dash camera, the Go 6100 is ideal. However if you’re only an occasional nav system user a cheaper unit or free app might be more up your street. 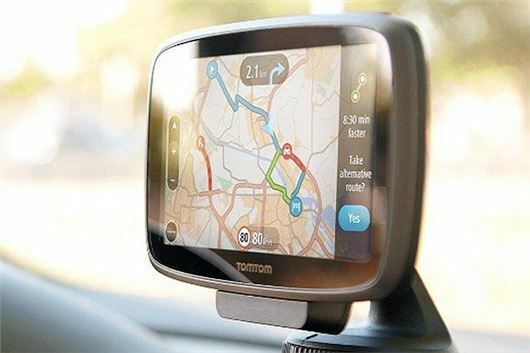 At £280 the TomTom is really meant for high-mileage drivers who rely on their sat nav for regular long journeys. For that kind of use it’s great, thanks to the clear screen, easy interface, traffic alerts and lifetime map updates.